EVENTS: Corporate, Special Events, TV, Casinos, Variety Shows, Circuses, Cruise Ships, Sporting Events, etc. 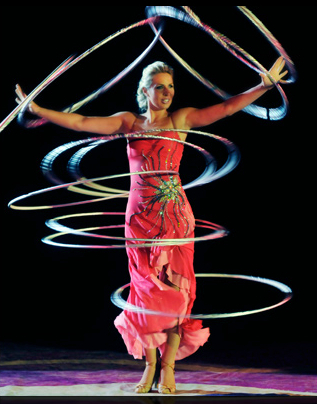 The fact that she is a three time Guinness World Record holder, with the most Hula Hoops simultaneously spun at one time, should come as no surprise. She was born into the rich heritage of the Russian circus, the most respected of circus traditions. Her mother is the noted Russian aerialist and her father is a famous clown from Belarus. It’s natural that she follows in their footsteps. She left her birthplace in Rostov-on-Don, southern Russia, when she was only one month old to travel on the road with her family. By the time she was five she was already in the act: tumbling, balancing, performing acrobatics and learning the disciplines and skills that would serve her in the years to come. A.G. is a true modern circus artist. She has a strong background in dance and choreography, having studied ballet and jazz. She is well versed in all the circus arts from comedy to animals to flying trapeze. Most importantly, that her strong technical skills are her work ethic. She has put countless hours into every show she has worked with and is a real asset to every show she is involved with. 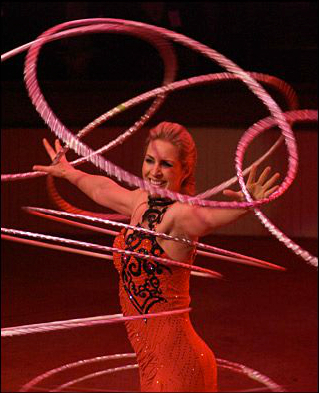 Hula Hoop A.G. from Talent Screening Room on Vimeo.